Valmar 56 Series machines build on the successful 55 series granular applicators. 56 Series units feature polyurethane tanks for simple clean out and greater longevity with a wider range of products. The 56 series can also be equipped with stainless steel metering for fertilizer application. Are you interested in a quote or demonstration of the Valmar 55 Series? Please fill out the form below and one of our Territory Managers will be in touch shortly. Salford's Valmar 56 Series machines build on the successful 55 series granular applicators. 56 Series units feature polyurethane tanks for simple clean out and greater longevity with a wider range of products. 56 series applicators can also be equipped with stainless steel metering for fertilizer application. Whether you’re seeding or applying herbicides, a Salford Valmar 56 Series implement-mount applicator is designed to deliver unparalleled accuracy under a wide variety of ground conditions. Its rugged construction is sturdy enough to withstand the rigors of commercial use. With this level of built-in durability, the 56 Series is the right choice for your farm operation. Moreover, it incorporates a number of innovative features designed to make granular application easier, safer, and more precise than ever. Salford's Valmar 56 series line of seeders excel at cover crop application. The 56 series quickly and accurately meter a variety of seed and granular product sizes at a range of rates suited for cover crop seeding. The 56 Series seeders are best known for their value, versatility and adaptability. 56 series seeders are routinely setup for seeding with tillage implements, heavy harrows, high clearance sprayers, and a variety of other implements allowing producers to accomplish more work with each pass. 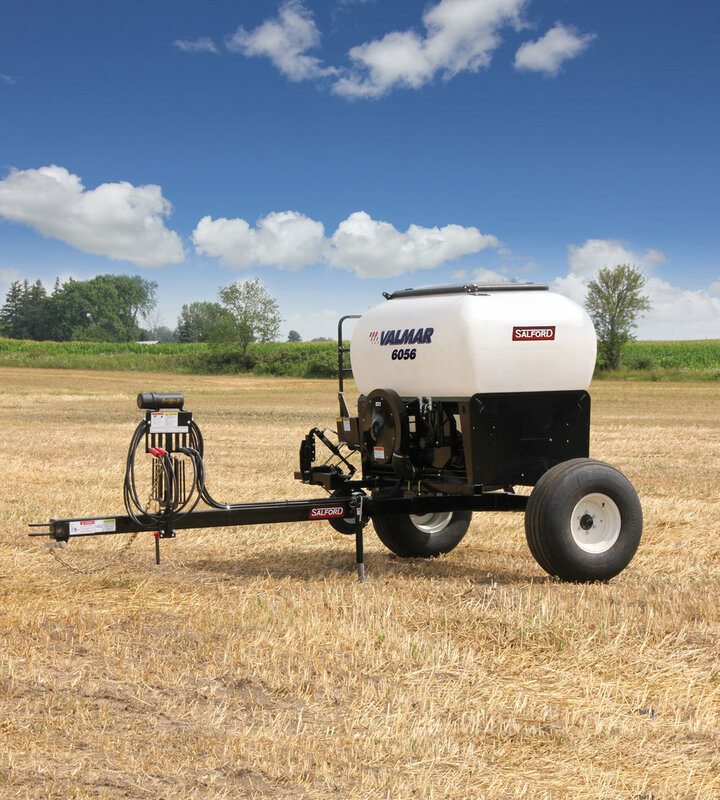 The Valmar 56 Series applicators achieve their accuracy thanks to a ground-driven metering system that ensures an accurate application rate regardless of ground speed. 56 Series applicators use a 60-speed gearbox that allows the application rate to be increased or decreased in increments of five percent. Drive ratio changes can be made at the gearbox, eliminating the need to move chains and realign sprockets. For cropping conditions that require a rate change on the go, an optional Alternate Rate Kit can be added to allow an instantaneous rate change. Or, simply by installing a hydraulic drive system, you can eliminate the ground drive and be ready for use with most GPS or variable rate systems. 56 series applicators are most often configured for broadcast application on implements from 16 feet to 80 feet wide. A simple mounting system from Salford allows the broadcast diffusers to be positioned for total ground coverage. Diffusers can be mounted in front of or behind the implement depending on what product you're applying and the implement you're mounting to. The semi translucent hopper on the 56 Series applicators enables operators to visually check the product level in the hopper. The 56 Series also features a manifold pressure gauge to ensure an adequate air flow is maintained for even product distribution. Finally, a warning light and buzzer are included on the in-cab control unit to alert the operator of any problem with the air supply. Calibrating an applicator is necessary to ensure proper flow rates, especially when determining the settings for new products or various sizes of seed and seed mixtures. The 56 Series applicators make this process easier by allowing the venturi and manifold system to be dropped so that a funnel tray can be inserted for easy collection of product. Operators can use the crank handle to simulate ground travel and establish precise calibration of any product. This also makes emptying the hopper an easy and safe procedure. The 56 Series applicators feature a number of innovations that make maintenance and cleaning easier. Perhaps most important is the location of the hopper shaft. By placing the shaft outside the hopper, product stays clear of the bearings and allows them to be serviced even with a full hopper. The outside shaft provides the added benefit of enabling the electric clutch installation to allow half-width application on either side of the implement (not available on the 1656). A convenient hopper-bottom slide gate enables the rollers to be removed for servicing or cleaning without draining product from the hopper. Integration Simplicity - The 3-point hitch mount and the Valmar tow behind eliminate the need for implement specific mounting brackets and hardware making the 56 Series instantly compatible with virtually any implement. The ‘turn-key’ solution greatly simplifies setup requirements. * ISObus compliance does not guarantee compatibility with all functionality on 3rd party ISObus displays; Non-ISObus displays are not compatible with this controller. Always consult with the display manufacturer before purchase – Prescription mapping and/or auto section control may require software unlock. Ensure latest display firmware version is installed.